There are some tips you can follow to improve your game and lower your score. 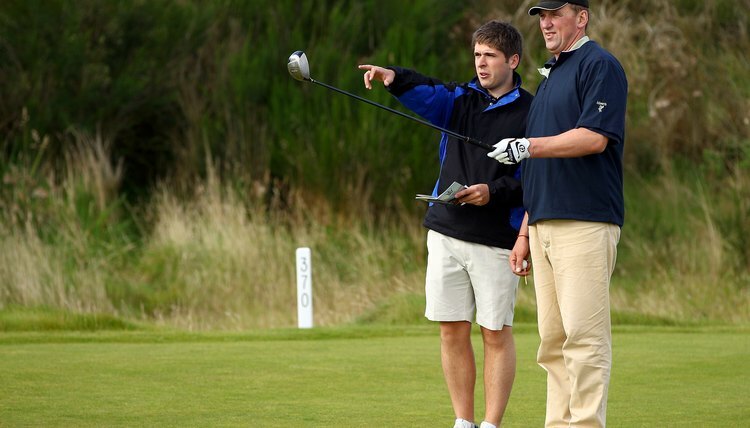 To improve your golf game and lower your score, there are some tips you can follow. Many players, including the pros, use a “pre-shot routine” before hitting a tee shot. This is a consistent practice that serves to focus your mind and check the fundamentals. In addition, improving your short game by honing your chipping and pitching techniques can help you play a better game of golf. As a rule of thumb, putt when you can, chip if a putt won’t work and pitch only if the two other options are not feasible. Hitting a good golf shot begins even before you hit the ball. If you watch the pros, you may notice that many of them go through a “pre-shot routine” before hitting off the tee. This routine can vary from person to person, but the goal is to focus on the shot mentally and aim for consistency by starting off with the same motions and thoughts for each shot. A pre-shot routine can begin from the moment you take the club out of the bag. Notice the contour of the fairway and the position of the pin, as well as any conditions such as wind that may affect the shot. Align the shot by choosing an intermediary target about 2 feet from the ball, and make sure your club face and your body are aligned to the target line. Check your grip, posture and ball position, and take a relaxed practice swing. Now you should be ready to hit a shot with distance and accuracy. Most golfers know that the short game is where you can shave points off your score. For the chip shot, use your normal grip with your hands secure and your arms relaxed. The ball will be in the center of your stance, which is narrowed with the weight slightly to the left. Bend into the shot with your arms hanging from the shoulder, and take the club back with a small swing. The ball should land on the front of the green and roll to the cup. The amount of roll will depend on the club you use. Choose a chip shot when you want mostly roll and little carry, when the lie is close or bad. For shots where you need more carry and less roll, use a pitch shot. This shot is a good choice when you have an uphill or soft green, or when you are hitting against the wind. For the pitch shot, use a shortened version of your swing with more weight shift than the chip. Use a high-lofted club like a pitching wedge, sand wedge, gap wedge or L-wedge. The ball will be in the center of your stance, your hands will be in front of the ball and your feet will be less than shoulder width apart. Your distance will depend on how far back you take the club.